Last time I did my great big grocery shopping trip, I bought a bag of potatoes, thinking I could use them as a side for a weeknight dinner. Well, schedules changed, and I have been working a lot more than usual, so I rarely have time to make a hot dinner, let alone one with all the fixin's! However, I knew I had to use these potatoes fast, before they started to bud. Those little "eyes" freak me out, and it's so much extra work when I clean them -- which I hate doing in the first place! 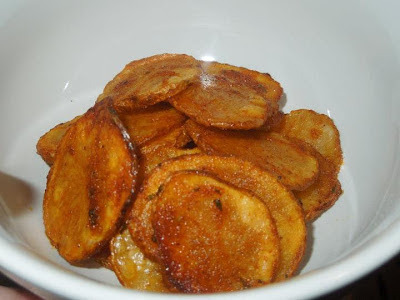 I had already made a stuffed potato for my blog previously, the Twice-Baked Seafood Skins, and I knew I wanted to make something different! Enter, the potato chip! If any of you have seen the commercial with Eva Longoria and Michael Symon (swooon! ), you would know that Lay's is looking for the next delicious potato chip flavor, and the winning flavor-thinker-upper could win $1,000,000!! So, we need the chefs at Lay's to visit The Community Plate, and use one of my flavor combinations, and I shall become a millionaire! And instead of sharing the winnings with all of my readers, I will simply go on hiatus at my job, and make my blog a #1 priority everyday, for all of my reader's viewing pleasures! (Which is better than any amount of money, right?!) So read on, create, enjoy -- and think of ways to get one of these flavors to the Lay's test kitchen! To begin, preheat your oven to 425-degrees. (This part depends on your oven. I am pretty sure my oven is old, and doesn't always heat up to the proper temperature, nor does it cook evenly. As with any recipe, you may have to experiment with your own oven!) Then, slice your potatoes into 1/8-inch slices. Some of mine were a bit too thick, which caused the chips to really just act as very thin potato slices, but they were good either way! 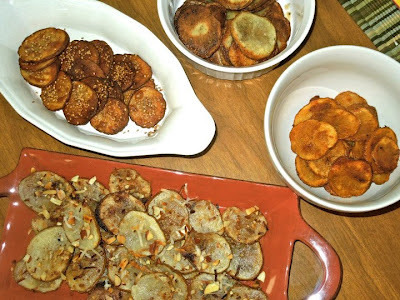 I used about 3 pounds of baking potatoes divided for all four chip recipes! Whisk together the first five ingredients. Generously coat a portioned helping of potatoes with the mixture, and let them sit in the bowl for about 30 minutes -- basically marinating the potatoes. 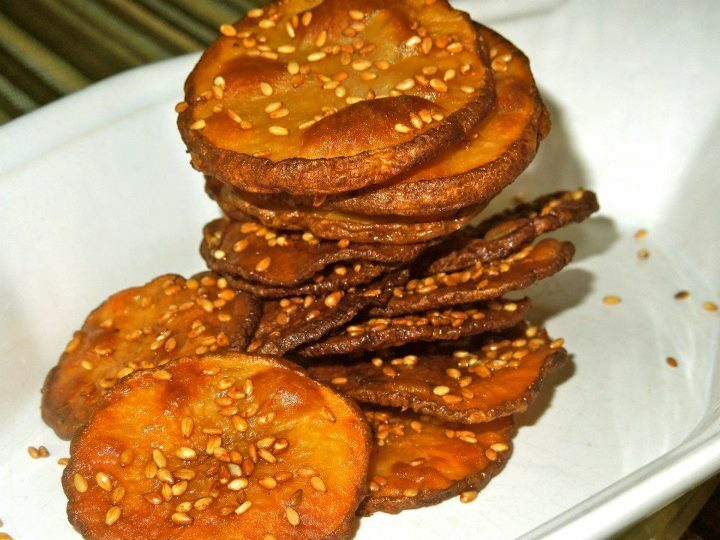 Meanwhile, toast some sesame seeds in a pan to release their nutty aroma, and set aside. 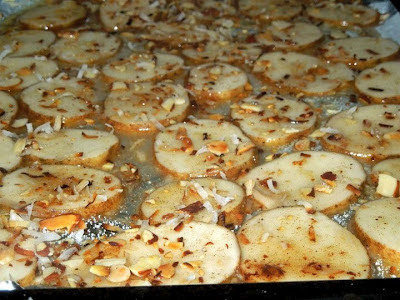 After the sliced potatoes have "marinated", spread them out into one even layer onto a greased baking sheet. Sprinkle with toasted sesame seeds, and bake for 30-35 minutes (for my oven), or until they're crisp! As soon as they are done, and come out of the oven, sprinkle with extra salt, pepper, and more sesame seeds, if you desire. Complementary Dip: Mix 1/4-cup sour cream, 1 tbsp. soy sauce, 1 tbsp. 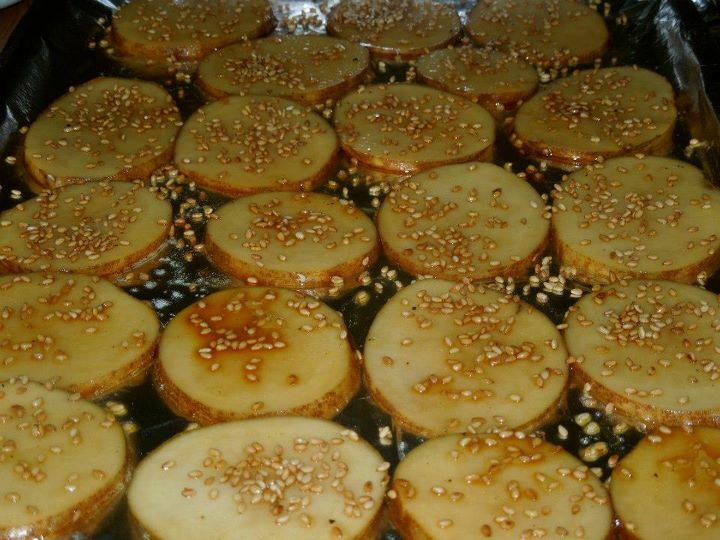 sesame oil, 1 tbsp. fresh ginger, 1 tbsp. minced garlic, 1 tbsp. rice vinegar, and toasted seeds. Mix well, chill, and dip! These are easy! Simply coat the sliced potatoes with all of the ingredients above. After letting them sit, to absorb flavors, arrange in a single layer on a greased baking sheet. Cook for 30 minutes, or until perfectly crisp. Sprinkle with salt as soon as they come out of the oven. Enjoy! Complementary Dip: 1 cup assorted olives (pitted), 1/4 artichoke hearts, 1/4 sun-dried tomatoes, 1 small cherry pepper, and 2 tbsp. olive oil. Pulse in a food processor until olives are at a fine chop, and all ingredients are incorporated. Olive dip! Whisk all ingredients together and coat sliced potatoes. Arrange in a single layer on a baking sheet, and bake for 30-35 minutes. After they come out of the oven, sprinkle with extra salt and a bit of lime zest and let crisp. Mmmm, these were a delightful treat! Complementary Dip: Mix 1/4 cup sour cream, 1/4 cup cream cheese, 1 packet taco seasoning, 1 tbsp. lime zest, 1 tbsp. cumin -- spread in a baking dish and top with shredded cheese and bake for 10 minutes. Whisk together the first four ingredients. 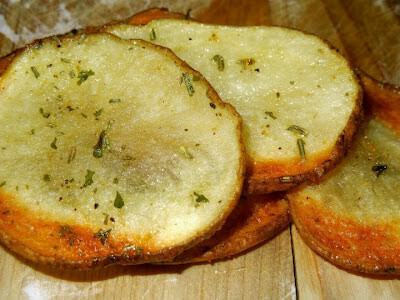 Let sliced potatoes sit in mixture to absorb flavors. Meanwhile, toast up coconut and almonds in a skillet until they start to brown and release flavors. 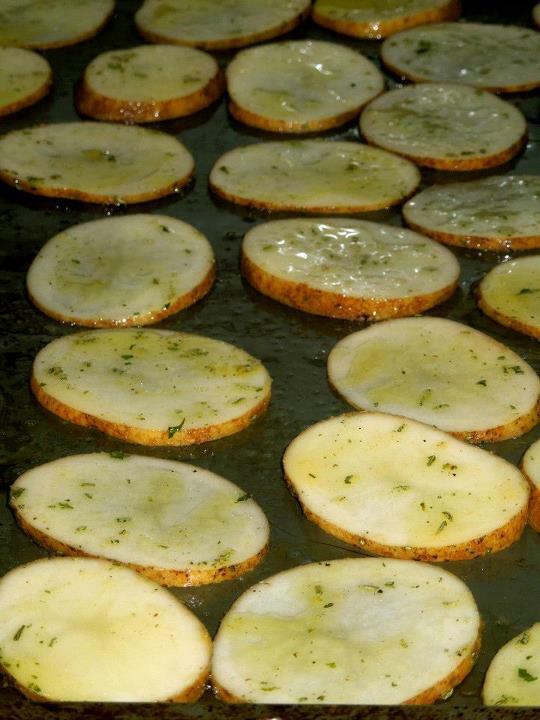 Arrange potatoes in a single layer on a greased baking sheet and baked for 30-35 minutes. When they come out of the oven, sprinkle with coconut and almonds, as well as a pinch of salt and sugar. Mix 1 cup ready-to-eat cheesecake filling, 2 tbsp. lemon zest, 1 tsp. cinnamon, 1 tsp. vanilla extract. Chill for 30 minutes, and enjoy!